History SPOT will soon be our new home for the IHR research seminar podcasts, live streamed events and online research training materials. It will also be a place where you can discuss these resources further and interact with others who share your interest in these topics. 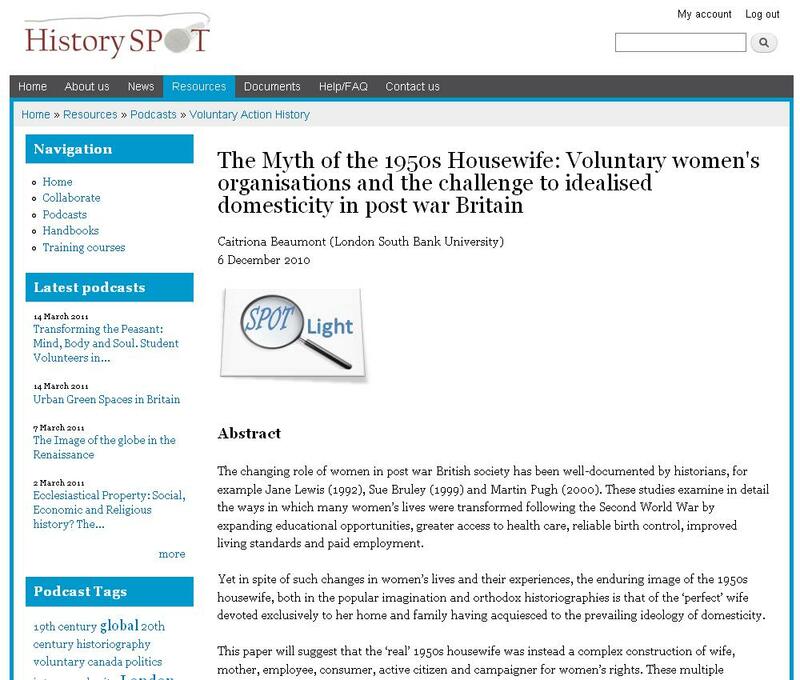 We very much hope that History SPOT will grow into a useful and even essential resource for historians from the UK and indeed the world. As I explained yesterday we should soon be in a position to announce a launch date, but in the meantime here are a few screenshots from the platform. Tomorrow sees the start of our annual Anglo-American Conference. This year the subject is Health in History which should be both an interesting topic in itself and a highly topical one considering the current Health bill being discussed in Parliament. This is an event that we will be podcasting which means a short pause in my posts concerning last week’s workshop on online training. I’ll begin again next week with a brief synopsis of the presentation given by my colleagues Mark Merry and Simon Trafford. Just a brief update today! A few weeks ago I posted a little teaser image for our upcoming platform: History SPOT. I had hoped then that we would be launching within a fortnight but it was not meant to be. The problem is not content – that is already uploaded and ready to go. The problem is a technical one with the platform itself. To ensure that these three systems work well together and to enable us to moderate user content we realised that we would need to ask users to sign up for a free account and link the systems together using a single sign-on. ULCC (University of London Computer Centre) have been working on the single sign-on for us and we very much hope that it will soon be ready and we can launch. It has, however, proven more difficult to achieve than either us or ULCC originally envisaged. Tomorrow I will provide you with some screen shots from History SPOT and a little more detail about what you can expect once it is up and running. At the workshop held by the IHR on Tuesday this week we held presentations from myself, my colleagues at the IHR Simon Trafford and Mark Merry (IHR Training), and Chris Williams, Stuart Mitchell, and Wendy Mears from the Open University History MA course. Over the next few days I plan to briefly summarise what each of us said (in general terms) and say a little about the subsequent conversation that occurred in the break out groups. Today, I will begin with the first part of my own presentation a discussion of online training that already exists online. In the humanities there is very little in the way of online courses. The Open University are the big exception of course. They provide various short courses, a foundation and undergraduate degree programme and a History MA. Most of these contain a face to face element and the provision of physical books, pamphlets and associated materials. Their online content is largely structured through the use of an open source virtual learning environment (VLE) named Moodle. Moodle (which I will talk a bit more about next week) is the same VLE system that we are using for the research training in History SPOT. The OU also use Elluminate! a Virtual Classroom which provide live lectures and seminars online. But there is much more online with regards to the OU than their actual courses. For starters the OU have developed a ‘taster’ website recently rebranded as Learning Space. This site provides potential students free course content and exercises as a draw toward the larger tutor-led courses. The OU is also very proud (and rightly so) of their podcast content on iTunes-U. As of 16 May 2011 the OU could boast 35,000,000 downloads from their store with the vast majority deriving from overseas interest. The OU are by far the most popular source of academic content on the iTunes platform. The University of Oxford have developed around 15 short courses in History and History-related subjects. Included in this number is a highly popular and well-regarded Advanced Diploma in Local History. This is a 1 year part-time course delivered entirely online. In 2007 the University of Warwick attempted to build and gain accreditation for an online only MA in History. The attempt ultimately failed to materialise but the extensive hard work that was put into developing the course can still be found on their website and is well worth a look. I’ll end today’s post with a few bullet points showing some of the features and tools that most of these online courses use or planned to use. 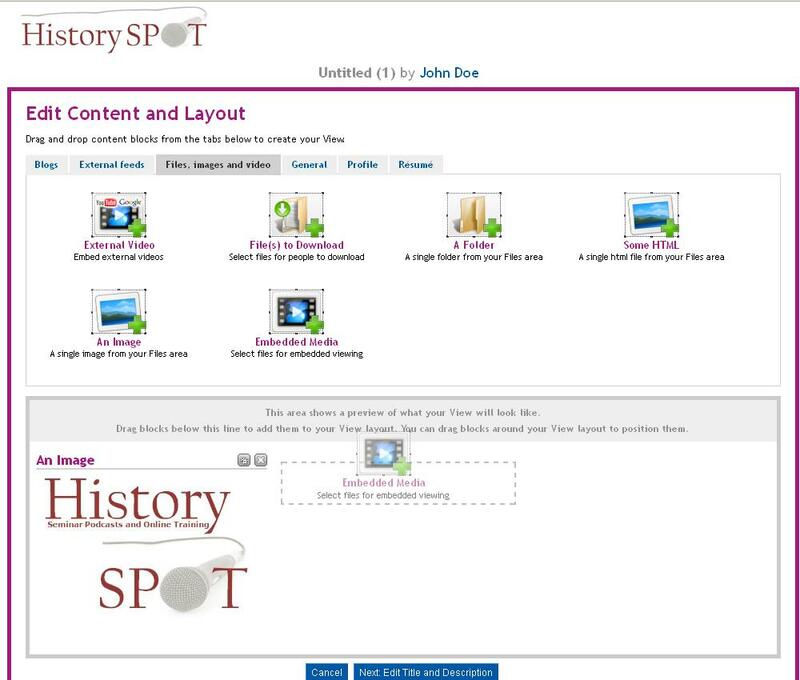 Next week I will talk a little about the second half of my presentation and in the process give you a sneak preview of the upcoming History SPOT platform. Earlier this week the IHR held an afternoon workshop on the topic of developing online research training and course delivery. The event attracted around 20 people from various professions and bringing with them differing expertise. In all the event was a great success with a good deal of discussion taking place concerning the nature of online training, best practice and limitations in comparison to traditional face to face courses. It quickly became apparent that the ideas concerning online training that we, at the IHR, are currently considering are very much the same as that which the Open University and others are already grappling with. It was interesting to note that the OU spend around 3 years developing their online courses much of which is concerned with getting the processes behind the scenes right. Having ourselves experimented with an online course on Moodle (which I hope will one day see the light of day!) I can easily see how time consuming it is just getting the sign-posts inserted into useful places, not alone the length of time it takes to consider course structure and design. You can’t just upload a face to face course ‘as is’ and expect it to work! I think for me, personally, the workshop helped to bring to focus a very simple issue with regards to online courses: Are we able to translate everything that we do in face to face teaching and training onto an online platform and make it equally as useful and understandable for the learner? We decided that no, it was not possible, at least not entirely. What we did realise was that training about resources and processes can work very well online (perhaps better in some cases) but that discussions concerning concepts and ideas is much harder to put across. Palaeography is one such topic which we felt an online course could work even better than face to face. Students catch on to this type of training at greatly varying speeds and traditional training can end up holding back some students and losing others somewhere in the wilderness. Yet, in an online setting students really would be able to go at their own pace and, due to the nature of the training, would probably lose very little in the translation from the real world to the digital. Tomorrow I will continue to talk about the workshop with a little bit about Online History Course that are already on the Internet. Hello and welcome to this week’s SPOT Newsletter. Today we have two papers on Britain. The first focuses on gambling laws in the early twentieth century whilst the second discusses the proliferation of museums in the nineteenth century. Although these topics do not share much in common they do, in different ways, focus on the issue of class particularly the so-called bourgeois. 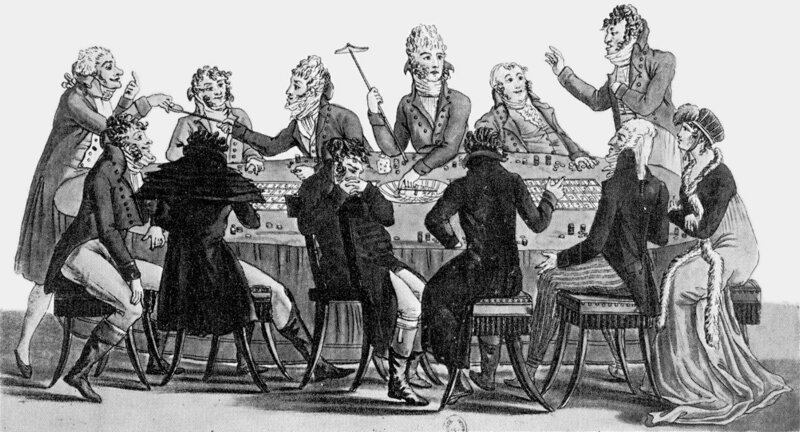 The Sports and Leisure History seminar was presented with a talk by Seamus Murphy about the circumventing of gambling and licensing laws by both the rich and the poor in the early-mid twentieth century. Murphy focuses on the awkward legal rules that attempted to outlaw Gaming parties especially those that floated from venue to venue. These games tended to be held by the wealthy and upper classes as opposed to the lower level gambling organised by service men especially during the Second World War. Catching the organisers was difficult particularly because they could claim that they were holding the party as a social event rather than for financial gain. Defence Regulation 42CA which attempted to deal with illegal gambling had various contradictions in its wording and struggled to define what exactly the state meant by illegal gaming. Early in the 1950s objections increased against the legislation’s loose words and in 1952 Defence Regulation 42CA was removed and Police were made to rely upon other regulations to deal with gaming parties. All of this ended in the 1960s when the British Government finally relented and legalised Casinos. John MacKenzie presents a paper that deals with the proliferation of museums in the nineteenth century from a multi-facetted viewpoint. MacKenzie is particularly focused on the British experience – both at home in Britain and in the colonies. The stress on bourgeois is essential to the argument as it is this ‘class’ who supported, visited and helped to create theses museums. The process of collecting and exhibiting items from around the world lay at the heart of imperialism. For the bourgeois the museum represented a realm of respectability that promoted intellectual society and the public face of scientific study. It also represented economic growth and an improvement of recreation with educational intent. The museum was viewed as a symbol of modernity and a form of globalisation in miniature. MacKenzie ends the paper with a comparison to later colonial attempts to build similar museums as the British that would also house a ‘miniaturised world’. MacKenzie explains that they found it impossible to achieve what the other museums had in the past and were therefore forced to look at alternative niches. Yesterday we held the final Digital History seminar live stream for this semester. Professor Tim Hitchcock admitted that this was perhaps not his most interesting talk (in terms of historical antidotes) but an important one for the promotion of new technologies as a means to ask new research questions and gather data. The Proceedings of the Old Bailey Online is certainly one of the success stories of early twenty-first century attempts at digitalising humanities research. So to hear ‘behind the scenes’ about the data that it is possible to gather from the Old Bailey archives was a refreshing alternative to straight forward discussion of history. For my part, I was the man behind the webcam! Although I am an historian myself and one that works, like Tim, in the early modern period, I tend to find it difficult to focus on the paper at the same time as monitoring the live stream and managing the ‘chat’. I haven’t had a chance yet to have a re-listen to the paper but I plan to soon. What has occurred to me however over the course of three Digital History seminars is the importance in talking more openly about how historians develop and make use of digital projects. We are used to presenting the results from our findings but not so much on how we came to those results in the first place. I believe that it is equally important to consider the route taken more closely; what tools were used and in what way? What were the limitations? What were the benefits? What are we trying to achieve in the first place? And, equally as important, how can we keep up with the new tools that computing is constantly providing us with? In the Q&A session Tim essentially motioned for historians to be trained in reading what has previously been the preserve of the sciences. I very much agree. But the question still remains – where do we get this training and how do we make it meaningful to us as historians? 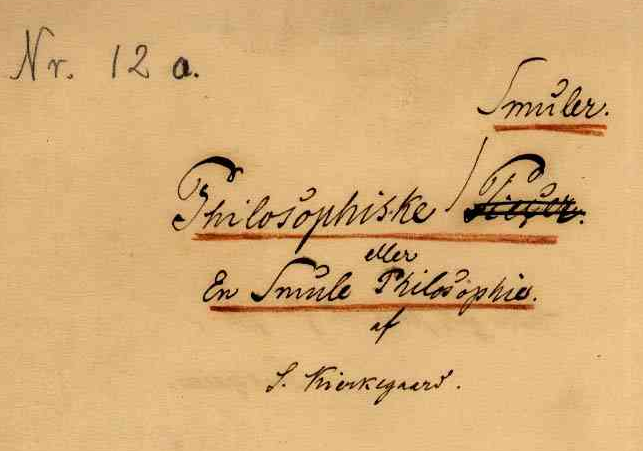 I must say that I’m very much looking forward to the continuation of the Digital History seminar next academic year and will be very interested to see what they come up with. In the meantime, I’ll leave you to take a look at the videos taken from these sessions and let you consider those questions as well. There are still spaces on our workshop about Developing Online Research Training and Course Delivery if anyone would like to join us? Please email us at history.spot@sas.ac.uk to register interest. This should be an interesting event as the discussion around online training is still an important topic for academia. In addition this will be the first oppotunity to see History SPOT in action! 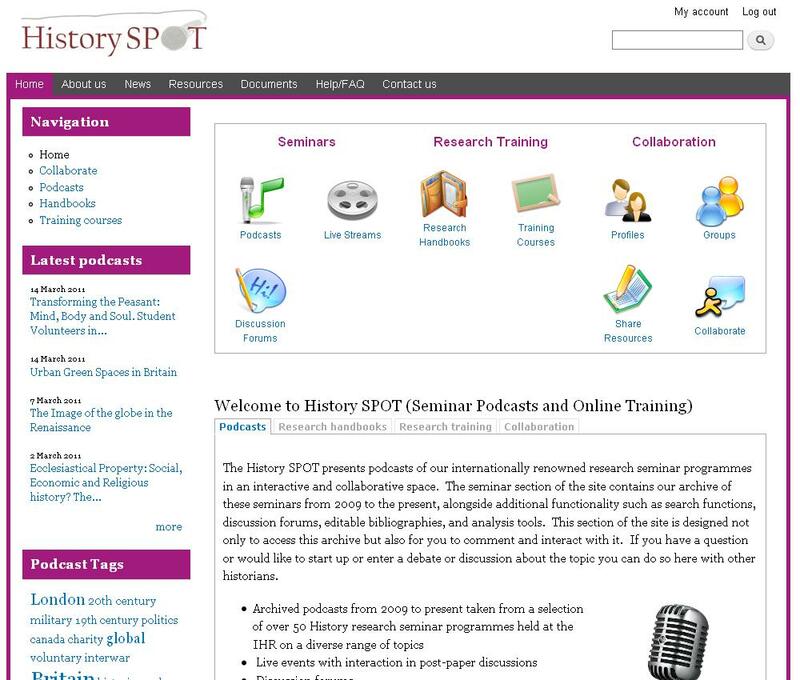 History SPOT [Seminar Podcasts and Online Training] is a new platform developed by the IHR to extend its postgraduate teaching and training onto the Internet. This platform links together the IHR’s research seminar programme and training materials together for the first time and hopes to promote a community atmosphere around the resources. 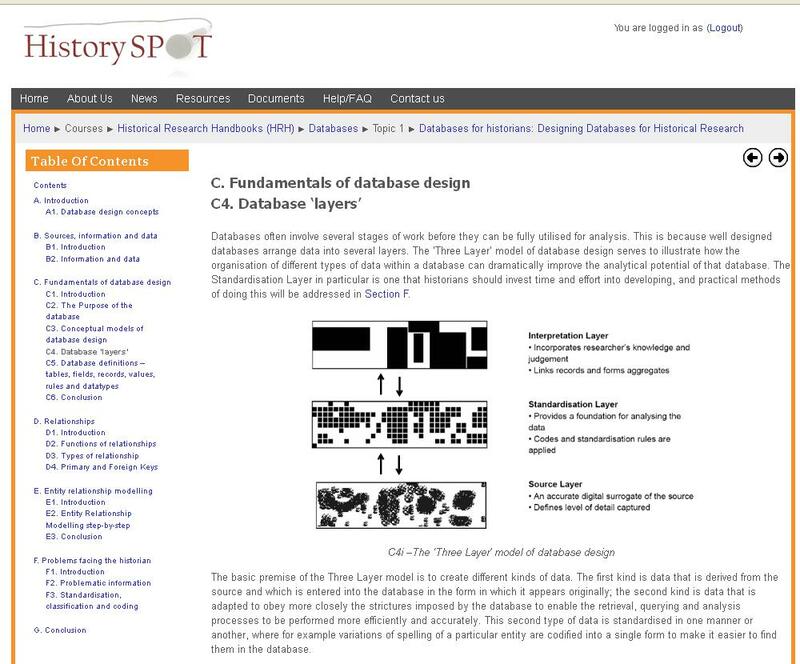 Matt will discuss the development of History SPOT and present the platform for the first time. The IHR have a strong reputation for its face to face research training of postgraduate historians which we have developed ever since our foundation in 1921. The emergence of digital technologies presents new methods to further expand our course content but also offers opportunities to bring our expertise to a wider audience. It also poses various difficulties in translating face to face content into digital resources and course structures. Simon and Mark will discuss the experience of the IHR thus far in re-developing content in this manner and where they plan to go from here. The Open University is the leading UK online provider for research training. Stuart, Wendy and Chris will be talking about the Open University’s History MA, specifically the part of it which is designed to introduce their students to the use of online primary and secondary sources for the study of the local and regional history of the British Isles. They have delivered this twice since they developed it, so they are in a position to talk about what they intended it to do, what it looks like, and how well they think it’s working.